What Happened To The Umbels? I was standing in the garden the other day, looking around, checking for blooms and bugs and doing some spot weeding, and realized I have no umbels in the garden. Where had they gone, because I know I planted several kinds of umbels. It didn’t take me long to answer my question. I apparently was a little overzealous with my hoeing in my quest for a weed-free garden and inadvertently hoed out the tiny carrots, dill, and cilantro seedlings that I had planned to grow in the garden. These are all members of the Umbelliferae family of plants, which is why I asked myself, what happened to the umbels? No dill for the cukes. It’s really almost unfathomable that I have no dill in my garden. Or maybe it is inexcusable? If you let dill form seed heads, you’ll have dill seedlings come up every year, more than you’d ever need, and then you can just transplant them to wherever you want them to grow. It’s almost a weed in that regard, and I do let it go to seed every year. The same is true with cilantro, which in my garden, mostly came up in the paths this spring, which transformed it from a useful plant to a weed, if one uses the definition of “plant in the wrong place” for weeds. So I pulled it all out of the paths and thus ended up with no cilantro to go with no dill. 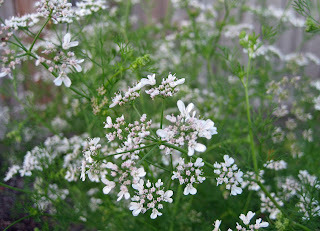 The picture above is of the cilantro blooming last summer. It’s pretty, isn’t it? It is unknown what happened to the carrots. Well, it is known. I just plain hoed them out accidently, when I was making room for some pole beans. At least that's what I think happened. I still have some seeds for all three of these umbels, so I’ll sow them in the garden this weekend and see what comes up. I’ll also keep the hoes away from those areas and maybe mark the rows with some string or something to remind me not to cultivate there. Oh, and I almost forgot. This year I also sowed seeds for parsnips, yet another member of the Umbelliferae family, and never even saw a seedling come up. Apparently my problems with umbels are more serious than I thought! What have we learned from all this? We now know more or less where the umbels went, except for maybe the parsnips. But perhaps more importantly, we learned that even after years of tending a vegetable garden, a gardener can goof something up, something as simple as the umbels. Doesn’t that make you new gardeners feel better? I tend to plant densely, so if seeds don't come up and something else goes in....I have a mixed bag, so to speak! Hoping it's not too late for your umbels this season. Obviously your umbels need a protective rope around them to keep you away, Carol - an umbelicle cord? I've been trying to get my dill germinated for months! I already have cucumbers, but there's no dill in sight! I worried that my pickles won't be authentic! The rabbits ate my carrots, There is one parsley plant with seeds on it, hope that counts as an umbel! I guess you just have to eat some humbel pie, and get sowing again hahaha! Lock up your hoes girl! I have the carrots, cilantro and dill growing in my garden. But I did something similar to what you did. I was hand-weeding a few weeks ago and accidentally pulled out all the lettuce seedlings, even though the lettuce row was marked. So you see I couldnt distinguish the weeds from the lettuce seedlings. I am sure no gardener would have done that. Anyway I sowed lettuce seeds again and now I am happily binging on home-grown lettuce almost everyday. So good luck with planting more umbels. I've been known to go a little crazy with the weeding too. The "scorched earth" method does leave things neat and tidy, but it also deprives us of some special plants. I wonder what Dr. Hortfreud would make of this? An umbeling experience for you, I am sure. We told you to be careful with your hoes! And, if you can stand one more: it's inspiring that you're umbel enough to admit your mis-takes. Because my garden's so small, rather than pulling things up I usually end up stepping on things. Oops. I forgot that I planted carrots in a block, and didn't notice the little label I made, and so I later planted beets there. So far I can't figure out if anything is coming up. I hate when that happens. I weeded out all my spinach one year, having first forgotten I planted it and then thinking it was a weed. Parsnips are notoriously bad germinators, so you did nothing wrong. I have a pile of dirt that we have collected during different projects around here and it is completely umbellified. I call it dill hill, but there is plenty of cilantro over there too. Yes, it does:) And I'm glad you defined "umbels" for me--I thought I had goofed by not planting whatever they were. I have this problem in my new butterfly flowerbed, where I've planted lots of seeds of new flowers--I can't tell the difference between some of the seedlings and the weeds. sorry about your umbel-less state. If the parsnip seeds were old, sometimes they don't germinate well, I do know that. I had some cilantro surprise me and come up where I hadn't planted it. wish I could mail it to you!